Demo gameplay following Ubisoft’s E3 conference has revealed a firsthand look at the playable map size of Assassin’s Creed Origins. The series is returning to the large connected multi-city game seen in earlier entries. A look at the map in the demo shows players will be able to explore much, if not all, of Lower Egypt, from Alexandria to Memphis and beyond during the Ptolemaic Kingdom. There’s no look yet at the size of the main city hubs, but the explorable world will certainly be one of the largest for any Assassin’s Creed game so far. In an interview with Game Informer, creative director Jean Guesdon likened the size to Black Flag’s Caribbean map, but this time it will be on ground and full of locations. Ubisoft also revealed in their demo gameplay that they have re-engineered climbable surfaces to make any surface scalable, implying that Bayek will be able to climb anywhere, or anything seen in the distance. 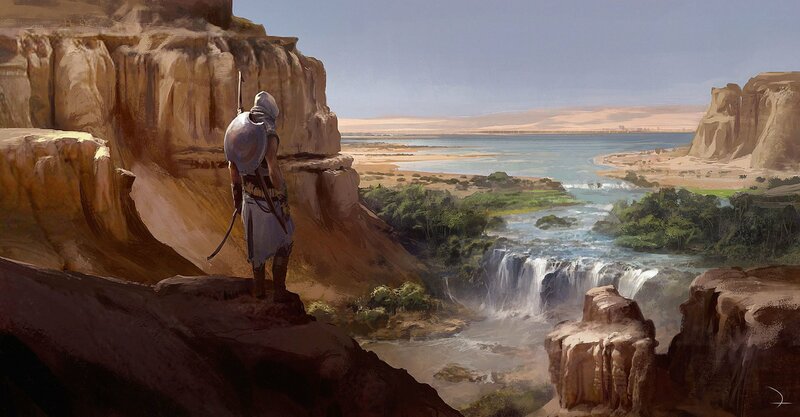 How much of this holds true in gameplay remains to be seen, however Ubisoft has indicated there will be rewards or treasure for those players who take their time to climb and explore the landscape. Players will be able to explore Egypt using various forms of transportation ranging from boats, camels, and horses to on foot. Assassin’s Creed Origins launches October 27, 2017 on PC, PS4, and Xbox One. Gameplay at E3 has given us small a look at the various regions that will be explored.